So few days the stories of Sai Baba will be written and visualized, I also hope that the readers read the stories of Sai Baba with much interest and intensity. And read it slowly so that it can be visualized. As if we are the part of all the happenings in the divine land of Shirdi, watching the leelas of Sai Baba, in his human form. Reading one story in such manner is far better than reading ten stories in hush and rush. Every early morning in the land of Shirdi blessed by Sai Baba, when the sun was about to rise, the light was slowly dispersing the darkness of the night. A melodious and bold voice would pierce the silence of that dawn. The sweet and painful voice would call for God. The voice and the song would make the people of Shirdi feel the necessity of calling to the God, such was the voice. The voice was of Radhakrishna Mai. 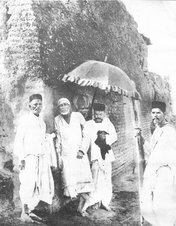 Radhakrishna Mai had come and settled in vibrant land of Shirdi, the blessed land on which Sai Baba moved and talked in his physical form, much before other notable devotees like Kakasaheb Dixit, Aranya Dhabolkar, Bapu Saheb Buti, Sagun Meru Naik, Ramchandra Atmaram Tarkhad, Dr. Chidambar Pille, Saint Upasni Maharaj and Sri Sai SaranAnand Maharaj. 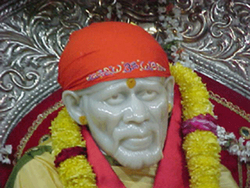 In 1907 A.D. , at the evening time, Sai Baba was sitting in Dwarkamai, with his hand leaning on the wooden rest. The sun was moving slowly towards the setting point. The cattle were moving towards their shade after gracing in the nearby fields. At that time, at near distant was a building called Chavadi. The building was quite in a depilated condition. Other than that all the sides were open. One could see at distant horizon from the Masjid Mai or Dwarika Mai. Around the Dwarka Mai there was no fencing of any kind. Just the divine and powerful and sacred vibrations. 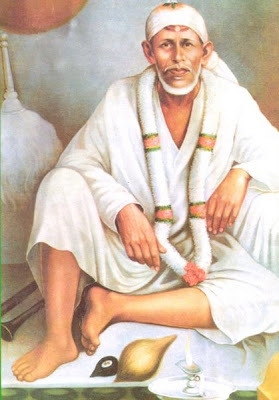 At that time Sai Baba’s eyes saw at a distance, a figure, clad in white clothes, moving towards Dwarkamai. Sai Baba kept on gazing in that direction, as if waiting for someone. 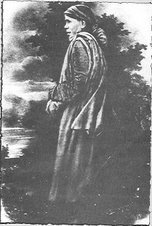 As the figure came closer and closer one could see that it was a female, in white clothes. A cloth bag was hanging on the back of her shoulder. In one hand was a ektara, a musical instrument similar to guitar, with just one string. And in other hand was kartaal yet another musical instrument. On her forehead was a tilak according to Madhva Sampraday, a long line with black color abil, on both the hands were bangles made of Tulsi beads garland. Also the neck was decorated with Tulsi plant beads. The dark hairs were hanging from her head, reaching below her knees. As she came nearer to Dwarikamai, all the eyes fell on her. Though the clothes she wore were not very tidy, one could see the charm on her face, which would demand respect at once. Reaching near Dwarkamai the lady unburdened her shoulder by putting the cloth bag on the land of Shirdi. She also put off the musical instruments from her hands. 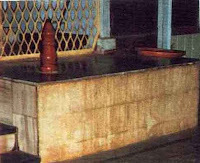 Without climbing up the stairs of Dwarka Mai, the lady bowed down, touched her head on the sacred land of Shirdi and then joining both her hands, she did Namashkar to Sri Sai Baba, who was sitting in Masjidmai. From her cloth bag she took out a beautiful idol of RahaKrishna. ( Krishna symbolizes God and Radha the lover of God, the name of Radha(lover of God) is taken before the name of God in Hindu tradition, signifying the importance of God lover, such lovers of God are rare, who craves for Only and Only God’s Love). The beautiful metallic idol was of brass, of about 9 inches, she gathered two bricks from around, placed them together, covered them with a vastra (piece of neat cloth), placed the idol over it and sat with the Kartaal in her hand. With the music she began to sing with the pain in heart. The high pitch voice was singing and calling for God. 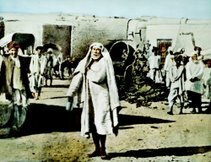 Saying that The name of Ram is in my mind,how do I please Ram (God) O’ Sai, I am weak with the karmas, how do I sing the glory of God O’ Sai. She sung a Bhajan by Mira Bai, the notes she sang seemed to become one with Krishna (Mira Bai’s love for God was God in form of Krishna). All the notes seemed to be merging and melting in Krishna, such was the love and pain flowing through her heart for God, while she was singing. People of Shirdi, attracted by the music and pitiful and melodious songs, sung in high pitch, began to gather near Dwarka Mai. As the bhajans were sung, the people were wrapped by the magic of it. They forgot time, they forgot their daily hassles of life. The hearts of the listeners were experiencing something which they could not understand nor could they explain. The earthen lamps lit with oil, began to get dim, yet nobody’s mind and heart was getting ready to mend them, such was the environment created. The bhajans continued till midnight. Sai Babadid not leave his Asan(seat), people forgot the sleep. 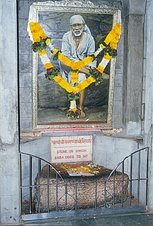 Even the beloved devotees of Sai Baba, Tatya Patil and Mahalsapati were rapt in the environment. At last the throat of lady(RadhaKrishnabai) took rest, the hands stopped playing on the instruments. The lady went deep in Samadhi. Still the listeners were in the effect of music. 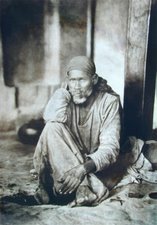 I have been searching for details about this enigmatic character, who played a quiet but significant role in Shirdi Baba's life, and the life of his other devotees then. This is the first note I have got in my search. 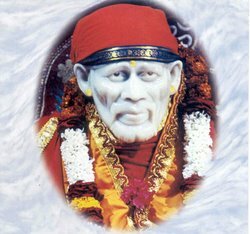 and i read in one book "Sai Vanni" compiled edited by Dr. Vinni Chitluri, that she was died in at the age of 35. and she told Baba that she wanted to merge in god now she cant' bear the pain of seprateness. and Baba says she merged in God. This info is based on that book , but i need to know about her daily chores, her dress up and how she feels when Baba told her not to come in his presence to dwarkamai. please if soem one can post. There is some more on Rahakrishna mai in a Gujarati biography of Swami SharanAnad named SaiNath Na Sarane. I will be posting from the same, but it will take some time. Thanks Alpesh for quick answer, I believe the info which you are going to provide will be in english only as I dont' understand Gujrati. hindi or eng is ok.
May Baba bless you forever. Aplesh i too want to know more about radhakrishnamai and please send it in english so that it will be helpfull to me.. Thanks a ton for the posts. Believe me for a moment I was in that place standing and looking at them all. Unfortunately there is no pic of Radhakrishna mai as she didn't allow anyone to take her pics. 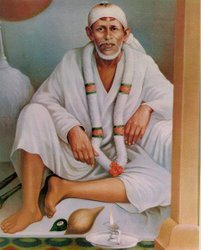 My obeisance to the Lord Sai and to his devotees.